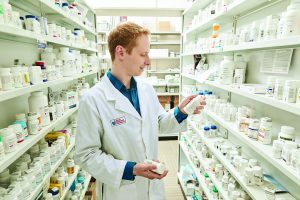 COSTA MESA, Calif. — Good Neighbor Pharmacy ranks highest among brick-and-mortar chain drug stores for customer satisfaction, with a score of 903, in the recent J.D. Power 2018 U.S. Pharmacy Study. Ranking second behind the AmerisourceBergen Corp. network was McKesson Corp.’s Health Mart (890). Rite Aid Corp. was third (846). Sam’s Club ranked highest among brick-and-mortar mass merchandiser pharmacies, with a score of 892. Costco (860) was second and CVS Pharmacy inside Target (859) placed third. Wegmans ranked highest among brick-and-mortar supermarket pharmacies, with a score of 906. H-E-B (897) placed second and Publix (891) was third. Among the different pharmacy segments, supermarkets have the highest levels of overall satisfaction (863). Humana Pharmacy ranked highest in mail order with a score of 885. Kaiser Permanente Pharmacy (866) was second and Express Scripts (862) placed third. The U.S. pharmacy industry, historically one of the most customer-centric industries measured by J.D. Power, continues to set a high bar for delivering superior levels of customer satisfaction in both the brick-and-mortar and mail order segments, according to the study. Among the key factors driving the highest levels of customer satisfaction are the availability of health and wellness services in brick-and-mortar pharmacies and the timeliness of delivery for mail order pharmacies. • U.S. consumers love their pharmacies. The average customer satisfaction score for brick-and-mortar pharmacies (847 on a 1,000-point scale) and mail order (859) compare favorably with other high-scoring industries evaluated by J.D. Power, such as direct banks (863), property and casualty insurance companies (860) and full-service investment advisors (839). • Retail health clinics are paying dividends in customer satisfaction. Among brick-and-mortar pharmacies, the key driver of overall customer satisfaction is the availability of health and wellness services. Availability of these services is associated with a 66-point improvement in overall satisfaction. Such services are currently present in 86% of chain drug stores, 83% of supermarket pharmacies and 75% of mass merchandiser pharmacies. • On-time delivery is priority for mail order pharmacies: Among mail order pharmacies, the key driver of overall customer satisfaction is having a prescription ready/delivered when promised. Delivering prescriptions on time is associated with a 78-point increase in overall customer satisfaction. Customers also evaluate the speed of delivery, adding 42 points to overall satisfaction scores when prescriptions are received within five days of completing an ­order. • Service with a smile still matters: Amidst the talk in the industry about distribution channels, supply chains and drug costs, some of the most significant drivers of customer satisfaction in all pharmacy segments includes friendly, engaging service. Among brick-and-mortar pharmacies, the second-most-effective driver of overall satisfaction is “non-pharmacist staff greeted you in a friendly manner,” which is associated with a 64-point increase in customer satisfaction. Even in the mail order segment, a “thank you” from nonpharmacist staff is associated with a 17-point increase in satisfaction. The study, now in its 10th year, is based on responses from 10,749 pharmacy customers who filled a prescription during the three months prior to the survey period of May-June 2018.